They say you can learn a lot about a man by the kind of car he drives, so here’s a look back at the hot wheels and smooth rides that have revved the hearts of 500 Home Run Club® members over the years. 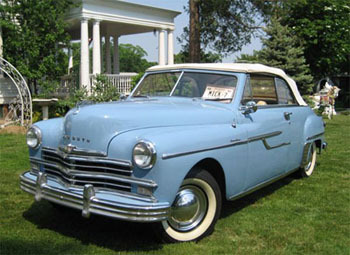 Mickey Mantle’s favorite car was a “Special Deluxe” Plymouth Convertible built in 1949, the year he graduated high school and was awarded a contract to play with the New York Yankees farm club. The Plymouth was the top production car during his teens years, so perhaps dreams of driving this car to the drive-in movie and necking with the girls in the hometown of his youth is what later motivated Mickey to find this great example. While Mickey owned this baby blue car, it sported the vanity plate "Mick-7." The car was sold in 1995 at a “Make A Wish Foundation” auction by Mantle. While Manny Ramirez is not officially a car dealer, he certainly has made a lot of news for buying, selling AND DONATING cars over the years. A few years ago, while playing for the Red Sox, he donated his gorgeous custom 1967 Lincoln Continental to be auctioned off with proceeds ($70,000+) going to Boston’s Franciscan Children’s Hospital. What a guy! The immaculate blue convertible had less than 72 miles post rebuild, was equipped with suicide doors, a spotless 500-cubic-inch Ford Racing powerplant, modernized interior, air suspension and some serious DUBs. 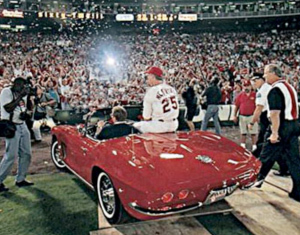 Mark McGwire has a soft sport for his 1962 little red Corvette awarded to him by the MLB Hall of Fame on September 8, 1998 after he hit his 62nd long ball of the season to break Roger Maris’ single season home run record. The car was displayed at Busch Stadium for several years before joining a private collection. In the summer of 1951 Ted Williams was signed to appear in a national advertising campaign by S.C. Johnson (Wax) company for a promotion featuring the new 1951 Nash-Healey roadster. At the end of the advertising campaign, “The Splendid Splinter received the one of a kind vehicle as part of his compensation. The thing that made the car so unique is that only 104 were ever built. To make the car even more appealing, the company commissioned a hand-built, one-of-a-kind roadster body for this special car costing about $25,000 (the equivalent of $215,000 in 2010 dollars). 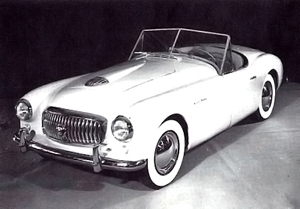 This car was widely shown and generated considerable publicity, but in the end it was not a commercial success and only 104 were built. Fortunately, there were many people more interested in the Nash-Healey than Ted Williams because he made a pretty penny on the deal.